Most vehicle owners get that changing the oil in your car is good for it, but few understand exactly why it needs done. 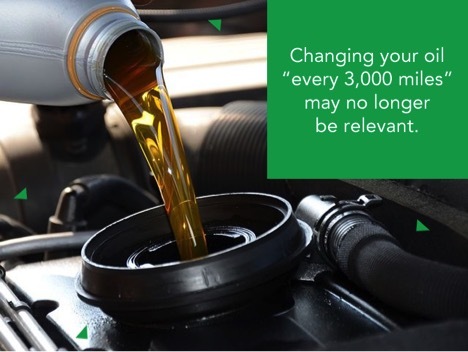 Most are vaguely aware that the age-old advice of changing your oil “every 3,000 miles” may no longer be relevant. The truth is, changing your oil is a simple yet incredibly vital task, but both vehicles and oil have become more sophisticated in the past few decades, which has allowed for more efficient and long-lasting changes. The more you know about the “modern” oil change and how it affects your car, the more effectively you can tackle your car’s maintenance schedule. The best part is you’ll get more life out of your vehicle. Let’s remind ourselves why we change the oil in our car in the first place. Oil performs several different functions: Most notably, it’s a lubricant that reduces the friction between the moving components of your engine when they rub together. Oil is also an absorber that draws in water and contaminant by-products of the combustion process, which helps protect your vehicle’s engine. Over time, the high temperatures in your engine will break down the oil, making it less effective as a lubricant, and it will become saturated with contaminants, so it will not be able to absorb any more. At this point, oil can’t “do its job,” and the other components of your engine will begin to suffer heightened wear and tear. That’s why it’s essential to drain the old oil and replace it with fresh, new lubricant. The old, conventional, but often still-followed advice was to change the oil in your car every 3,000 miles or so. It was believed that this would keep your car in peak operating condition. The old rule simply doesn’t apply to newer car models, however. That specifically means vehicles manufactured within the last decade or so. 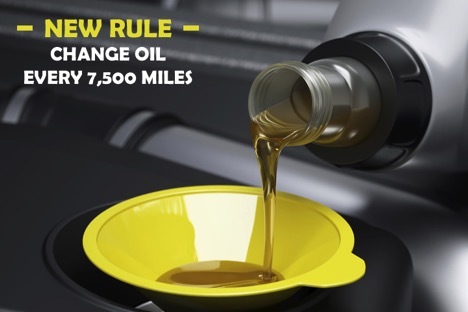 According to Edmunds.com’s car experts, a more practical rule of thumb for modern cars is to get the oil changed every 7,500 miles or so; more than double required mileage in the past. For certain vehicles, it’s all right to wait for up to 10,000 miles or more. What’s the reason behind the significant change in recommended regularity? First, modern technology and design have enabled cars to produce fewer byproducts and move more efficiently, which reduces the burden that oil has to bear. Second, oil itself has become more sophisticated. It stays cleaner for a longer period of time and is less susceptible to breaking down. Even after reading the foregoing information, it’s tempting to choose to continue following the “every 3,000 mile” rule. After all, changing the oil doesn’t really hurt your vehicle, and you’re better safe than sorry, right? But there are a number of good reasons to change your oil less frequently, the first being obvious: cost. Oil changes don’t entail an exorbitant expense, but they still add up over time if you change your oil three times more often than you need to. If you’re used to spending $100 a year on oil changes, cutting back to $30 can be pretty appealing; plus, you save the time it takes to make the trip to a lube specialist, or do the job yourself. But there’s another reason why changing your oil less frequently is a good thing: the environment. Even the best oil recycling programs are rather inefficient, and oil is a limited resource on the planet. Using your old oil for a longer period of time means less new oil is put into circulation, and that mildly reduces environmental damage and the overall demand for fossil fuels. Different cars require different levels of care. Various cars are going to call for different frequencies of oil changes. This holds true even for newer-model cars. High-performance cars may require more frequent changes, and higher-end models of a particular car may require less frequent changes. Though you can bank on the “every 7,500 miles” rule for most contemporary cars (say, from around 2007 onward), you can also probably get away with every 10,000 miles. If you’re ever confused about this, there’s a good resource for you: the owner’s manual. Every car owner’s manual will tell you exactly how often you should get your oil changed for that particular model. If you follow what’s written there, you’ll be in good shape. Different driving styles entail varying amounts of wear and tear. The way you drive your car will also have an impact in how often your oil breaks down or becomes less efficient. For example, frequent periods of stop-and-go driving can make your engine perform inefficiently. If you spend a lot of time idling, that can also increase the contaminants in your oil. Humid conditions will make oil absorb more water, and cold conditions can make your engine perform less efficiently as well, breaking down your oil faster. Keep this in mind in conjunction with the guidelines in your owner’s manual. Skipping oil changes is inadvisable. Just because you can change your oil less frequently, that doesn’t mean you can skip oil changes altogether. 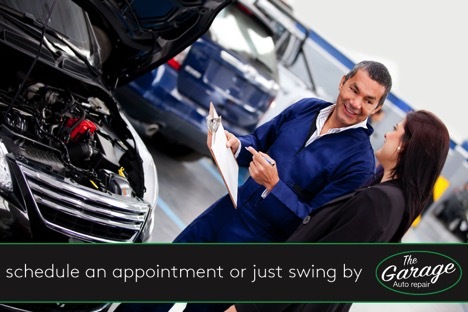 It’s still a vital process for keeping your car in good health, so make sure it remains a top priority. Oil changes are a good excuse for regular maintenance. Oil changes may be necessary less often, but preventive maintenance is still worthwhile. Most companies that provide oil change services suggest you use it to check up on your car’s health, to identify points of wear and tear that need to be proactively addressed. When you change your oil less frequently, you’ll have fewer opportunities to check for these points of service, so keep that in mind, and think about the advisability of bringing your vehicle in for maintenance anyway. If your vehicle is in need of maintenance, or it’s time to get your oil changed, be sure to schedule an appointment or just swing by The Garage Auto. We’ll give your vehicle the treatment it needs to keep running smoothly and providing you with the best performance over the long haul.